Friday night, some coworkers and I went to a nightclub called Triniti. The night started out slow but as it progressed, more people arrived and the night was in full effect. With Konyagi shots on deck, it was the most fun I’ve had in a long time. People came to have a good time and dance the night away. My coworker loves to salsa, so I even got some free salsa lessons. There was a live cover band from Nairobi, Kenya and they played everything from Miley Cyrus to Bob Marley. They were FIRE. I must go back before I leave Tanzania (read: forced to vacate the country). Saturday, I went to Bagamoyo, Tanzania, which is the next town over from Dar es Salaam. It took about an hour and half with traffic to get there. We toured the Bagamoyo College of Arts, where a current student showed us the college’s facilities. He said the school has a 3 or 4 year program, where they can focus on dance, drama, art or all 3. The college is located right on the water so of course we had to check out their ocean view. 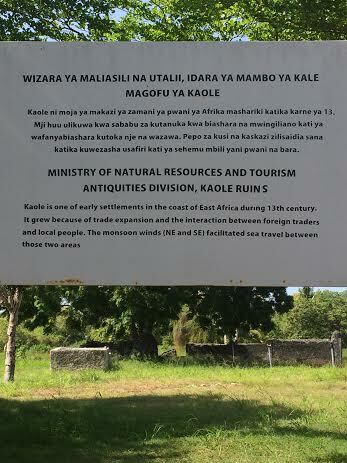 Next, we toured the Kaole Ruins. 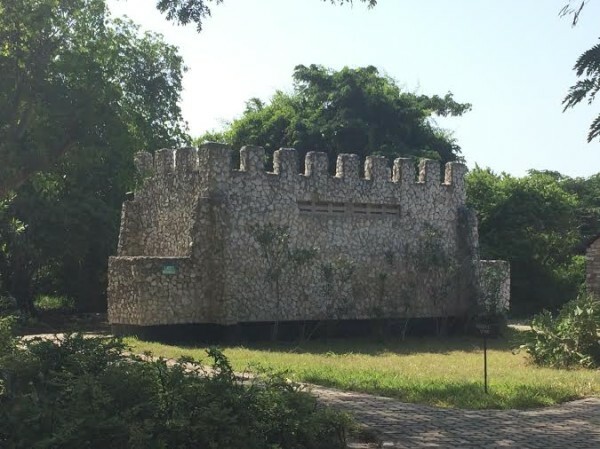 Dating back to a period between the 13th century and the 16th century, the Kaole Ruins are what remains of a Muslim Shirazi (small East African tribe) settlement. The site has two mosques (one of which is the most ancient in East Africa) and 30 tombs. The tombs are built with coral reef. The reef was burned and the ashes were used to construct buildings. How cool is it that they’re still standing? My friends even drank from an ancient well that allegedly has sacred water. I wasn’t convinced. Because the well had no covering & was open for all malaria-infected mosquitoes and other wildlife, I passed . After we toured the ruins, we visited a small museum that housed some artifacts from the Kaole ruins and Bagamoyo’s history. I learned that it was the German capital of East Africa during the 18th century. Bagamoyo became a trading post for German, Arab and Indian traders, who bought and sold ivory, fish and other items. Additionally, it was a trading post for slaves who were captured from Tanzania, Uganda, Kenya and a few other East African countries. Bagamoyo declined because the water was too shallow to hold larger ships, so most trading was moved to Dar es Salaam. Sunday, some coworkers and I went to the Baobab Home near Bagamoyo, a school and home for about 20 kids with HIV or AIDS. It was started by an American woman, Terri, and her Tanzanian husband in 2004. She said that while many people know about HIV & AIDS, there is still a lot of bad information being given to people affected by it. I was moved to tears by hearing the stories of some of the children. She told us about one of the girl’s mother, who is mentally ill (another taboo topic in Tanzania and much of Africa) and forced her children to beg on the street for money. The little girl was not in school, living on the street and at risk for sexual abuse. After the mother recently had her 9th, yes 9th child, Terri was able to get another one of the girl’s siblings in the program, and hopefully more of the children will follow. Terri and the Baobob Home tried to help the mother seek treatment but she was not cooperative. We planted trees, put stoppers made of recycled tires at the bottom of classroom chairs (which sounds easy but proved to be quite the task), and taught the kids how to ride bikes. They were amazing and full of energy. We were able to pick fresh guavas from a guava tree and ate them on the spot. They were so good! See more pics from my weekend below.